Gathering facts to make a decision about which sewing machine to buy can be challenging. Even if you ask friends for recommendations, they probably have personally owned only one or two machine brands. Ask a salesperson for an opinion and of course, they want to sell you the most expensive machine they carry because they will get a bigger commission. They also may be partial to manufacturers with whom they have the best relationship. Buyers must weigh every opinion and read reviews and decide for themselves. Here are some considerations to help you with your decision. There are basically four kinds of sewing machines: Handheld, Mechanical, Electronic, Computerized. Mechanical models were the first machines. In the 70s electric machines hit the market, followed later by the introduction of microchips which now offer us computerized machines. A handheld machine is the ultimate minimalist product. You can find them for as little as $15. A handheld allows you to mend on the fly without the financial commitment or the physical space required by full size machines. There are many machines that might remind you of a toy. Usually these are mechanical machines. An example is Singer’s Pixie Plus, a portable which sells for around $60. It’s very basic with four stitch patterns. Although it comes with a power cord it can also run on batteries in case you’re doing mending out of the back of your SUV. : ) The remainder of the sewing machines out there range from $99 to hundreds of dollars and include a variety of features. I don’t want a long-term warranty on anything but my marriage. If I had a 25-year warranty on a sewing machine and paid hundreds of dollars for it, giving it up when it became obsolete would be tough. Psychologically, a long warranty tends to make you want to hang on to what you’ve got. With the changes in technology daily, it stands to reason that keeping a sewing machine for many years will at some point result in owning an outdated machine, one that can’t offer the advances today’s machines can. Today’s computer technology has dramatically changed the way we sew. It has lightened our workload enabling us to complete projects very quickly. We’ve gone from manual four-step buttonholes to an automated one-step process. The biggest pitch for sewing machine sales people seems to be stitches. Sometimes the only price difference between models from the same manufacturer is the number of fancy stitches they offer. It used to be the only way to get special stitches was to insert cams into the machine, which act as a template for the machine to follow. But that’s no longer necessary. Newer machines offer stitches at the flip of a switch or push of a button. When it comes time to buy a machine consider the cost and ask yourself if you need all those fancy stitches and if you will really use them. When comparing machines there’s lots of sales talk about lower priced machines not being able to handle heavy-duty work involving several layers of fabric like denim, etc. Unless you’re making circus tents, this may not be a valid consideration. Like a machine that talks to you? They’ve got that. 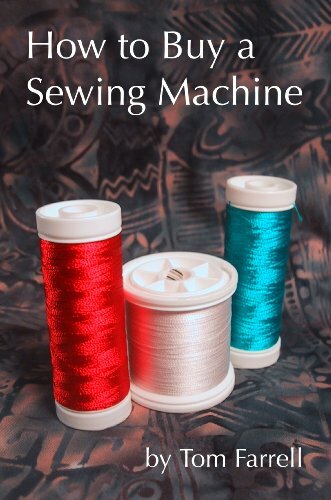 The machine will also beep when you try to do something that is beyond the machine’s physical capabilities, like asking it to zigzag a very wide stitch when the needle is already positioned to the far left or right. Auto Needle Threader – This can be a real luxury especially for people with failing eyesight. Hands Free Wheel - This is a winning feature which always ends stitching with the needle in the up position making it unnecessary for your hands to leave the work to change the needle position and disengage your fabric. Improved Lighting - New white light is easy on the eyes and reflects more true color. Front Drop-in Bobbin - This feature has been around for some time but newer machines are placing the bobbin behind a see thru door allowing you to predict when you will run out of thread. There are no surprises. You can check before you start sewing to be sure you have enough bobbin thread for the next phase of your sewing. One-Step Button Holes - This is a mechanical feature whereby inserting a button into a plastic tray on the machine allows the machine to determine what size buttonhole is needed. Not only determine it, but create it in one step. It also automatically stops when it’s done. Sewing machine manufacturers are located across the globe. Even after doing online searches it’s sometimes impossible to determine where particular machines are made. Sewing machine sales people tout the European brands as the best value but many buyers want American made brands. Jenome, which has become very popular in the U.S. and has manufacturing plants in Tokyo, also makes machines for Viking, Pfaff, Elna and Sears-Kenmore. So asking a manufactuer the question “Where are your machines made?” would probably be answered with “That depends.” The model of the machine seems to be the determining factor. Sewing machine companies often make their most expensive models in the U.S. and send the low-end models off to Asia for assembly. If you’re on a tight budget and only sew a few times a year, you might want to consider an older model used machine which will be inexpensive. Just be aware you might have a hard time finding attachments for it should any of yours get lost. You hardly have to worry about an attachment breaking because older machines were made sturdy enough to last 50 years or more. Be sure to give it a test run before buying. Repairs on older machines could be costly with parts harder to find. Sturdy older machines typically weigh a ton and won’t skitter across the countertop when you put the pedal to the metal, like some machines with plastic cases tend to do. In my lifetime I will probably own 7-10 different sewing machines. I’ve purchased a new machine every few years since I was about 16 years old and first started sewing. If I still owned my first machine I would be working on what could be considered an antique. There are many excellent quality machines on the market and with each one comes a huge fan club. In my sewing history I did not have the finances to buy one of these high quality machines, which also come with very high price tags. Every one of the machines I’ve owned has been a Singer. And that may help you to understand why my comments may seem biased. I know there are other excellent machines available but I have not had experience with them. What I can say is I never had a Singer machine break down, never had one that needed a repair, and have never been unhappy with the operation of a machine. My motivation for buying new machines has always been the same – to take advantage of some of the features offered on newer machines. I recently went shopping for a new machine and visited three different stores. While I certainly don’t know every brand or every feature they offer, I do have a well-rounded knowledge of machines in general and how to use them. When I asked questions of the sales people, I sometimes found the sales person knew less than I did about the product. Most salespeople I spoke to tried to steer me away from Singer products. There was quite a bit of discussion about the decline of quality in Singer machines and the use of plastic parts. One salesperson even mentioned exploding bobbin cases. After visiting stores, I went online and did a thorough search of reviews for the Singer machine I wanted to buy and found positive feedback. But I did see many reviews from people complaining about problems with other Singer models, although there was never a mention of exploding bobbin cases. Problems were less serious than that. Salespeople also warned me not to buy online because they said there's no warranty or classes. While you may not get a long-term warranty, you will find a limited warranty when you buy from an authorized dealer online. As for the classes, I may need to learn the features of my machine but I don’t need sewing classes to learn to sew. Classes offer a one-on-one with someone who is trained in using the machines and knows how it operates. That’s a valuable thing for someone new to sewing. I feel the sewing machine manual pretty much covers the things I need to know about the machine. If there’s something missing it’s easy to Google search questions like “how to thread the Singer 7442 “ and get a great explanation. Considering you can go online and find complaints on almost any product, I decided to stick with my decision to buy another Singer machine. I’ve had it for several months now and am delighted with my choice. What do you sew? What projects do you like to tackle? Can you predict how your needs may change in the near future? These are all questions you should answer before shopping for a new sewing machine. Go to stores, where you can touch and feel machines. Write down model numbers then go online. As with all purchases, a good place for research is the Internet where you can read what others are saying about the product you’re thinking of buying. Be completely informed about buying a sewing machine and find out how to take one for a test drive. Very informative article descibing our choices when buying a sewing machine, and I loved reading that the only thing you want a long term warranty on is your marriage! Great line! I learned to sew several years ago, but never purchased a machine. You have provided some good information that I can use in the event I ever decide to buy one. Thanks Diva! Oh, and by the way, I also agree with you on not wanting a long-term warranty on anything but my marriage! Love it!! Thanks Intro! Appreciate the comments! Great info - especially about the lack of need for a long term warranty. Thank, I loved this article, and I just happen to be in the market for a new sewing machine.